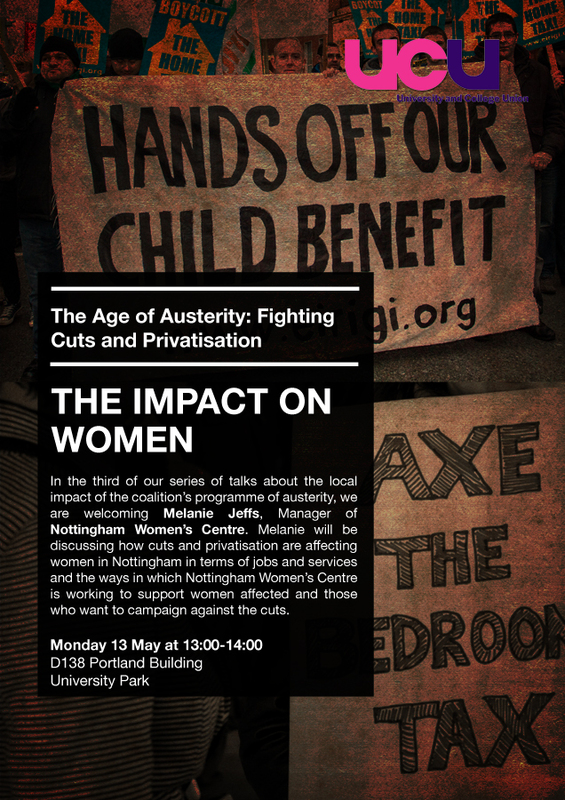 The Age of Austerity: Fighting Cuts and Privatisation — The Impact on Women! Austerity and cuts affect especially women. In the third talk on local anti-cuts initiatives, organised by the UCU association at Nottingham University, Melanie Jeffs, manager of Nottingham Women’s Centre, illustrated the triple jeopardy women are currently facing as a result of government policy: (1) cuts to jobs; (2) cuts to benefits; and (3) cuts to services. There are three key areas, in which cuts affect women disproportionately to men. First, the current government has announced that up to one million jobs will go in the public sector. Considering that two thirds of employees in the public sector are women, job cuts in this area inevitably will affect women more. As reported by the BBC in May last year, ‘female unemployment has been rising a lot faster than the male total’ (BBC News, 16 May 2012). Moreover, as Melanie Jeffs made clear, the economic crisis is also affecting the voluntary and charity sector now. As this sector is characterised by a predominantly female workforce too, the tendency towards higher female unemployment is likely to increase further. Second, it is especially women in our society, which carry major caring responsibilities. Unsurprisingly, any benefit cuts, be it to childcare benefits, be it to housing benefits through measures such as the bedroom tax, affect women more than men. Finally, cuts to public services affect women disproportionately. Women are much more likely to be lone parents. It is women who have babies and it is women who are more often subjected to domestic violence. When specialised local services are abandoned and women refuge centres are closed, women are therefore the first to suffer. In general, the state was regarded for decades as a great leveller, guaranteeing through employment legislation, benefits and public services that women have had an equal chance to develop their own talents. Recent cuts have drastically undermined this role and thus negatively affected women. Nevertheless, Melanie Jeffs’ talk was not all doom and gloom. It was time for women to fight back and make their voice heard at the ballot box, she argued. Thus, the Women’s Centre is closely involved in organising the Nottingham Women’s Conference on 21 September 2013 with the goal to raise consciousness and empower women to stand up for their rights.